Hi, I am interested in your 1988 Mazda RX-7 (stock #1679-TPA) listed on Autotrader for $9,995. I'd like to get more information about this vehicle and confirm its availability. 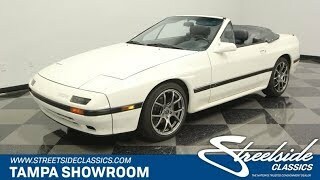 The 1988 Mazda RX-7 has matured into an intriguing and attractive grand touring machine, and the convertible version is the ultimate expression of the open road. Thats why were very excited to see an example thats this well preserved. The exceptional price is just the cherry on top. The RX-7 is a machine thats always full of clever ideas, and dropping its top only adds to the appeal. Dressed in its factory Noble White, it has been preserved correctly so that the sleek shape still looks contemporary. Of course, it also helps when great care is combined with the exceptional build quality of these Mazdas. So, the headlights fit flush against the body; the black trim line remains unbroken as it encircles the entire car; and the crisp black folding roof adds to the classic appeal. And those upgraded Enkei wheels look terrific on a Japanese modern classic like this. The result is a convertible that looks far younger than its age would suggest. A car like this is meant to be open to the world. So the gray leather interior does a great job of complementing the exterior white. The carpeting, door panels, dash, and bucket seats (with nifty speakers integrated in the headrests) are all well preserved. Youll slip behind the sporty three-spoke steering wheel and get excited as you grip the well-placed stick shift. Your heart will begin beating a bit faster as you watch the red-faced gauges begin to dance and yes, the tach is prominently the center just like a Porsche. But more than just a pure sports machine, the RX-7 was Mazdas flagship car, and so there are plenty of luxury features. It includes, power windows, power mirrors, cruise control, a premium factory AM/FM/CD/cassette stereo, power top, and air conditioning to help keep you cool while looking cool in this droptop. The RX7s real calling card was the revolutionary two-rotor Wankel engine. This is believed to be the original motor, and its exceptional condition tells you this was well-respected. No pistons, no crankshaft, no valves just a pair of triangular rotors inside a beer-keg-sized housing. The design was compact, efficient, and could provide the same power as its six and eight-cylinder competitors. But its true hallmark was that it could happily spin to 7,000 RPM with incredible smoothness. And you get to experience all of the powerband thanks to the full control of the five-speed manual transmission. Plus, the fully independent suspension, nice weight distribution, grippy Michelin tires, and four-wheel disc brakes combine to offer the ideal mixture of performance and comfort. Complete with owners manual, this preserved classic is a blast to drive down your favorite twisting piece of pavement with the wind in your hair and the sun overhead. So at this price, this total package classic wont be with us long. Call today!! !